The only place to be during a heatwave is inside, with the air conditioning going full blast. While most people don’t feel as hungry when the weather’s stinking hot, you still have to eat. But who wants to turn on the oven or the hotplates with the temperature soaring over 40°, as it is in Canberra this week? Here are a few ideas for delicious sustenance which involve minimum effort and no cooking. 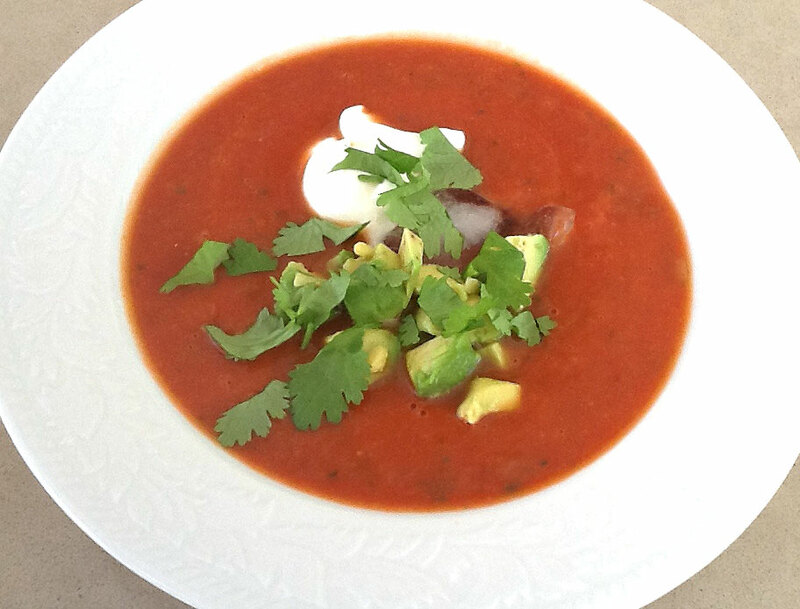 Gazpacho is one of the ways they cope with hot weather in Spain. This is a cheat’s version which is made in a jiffy. 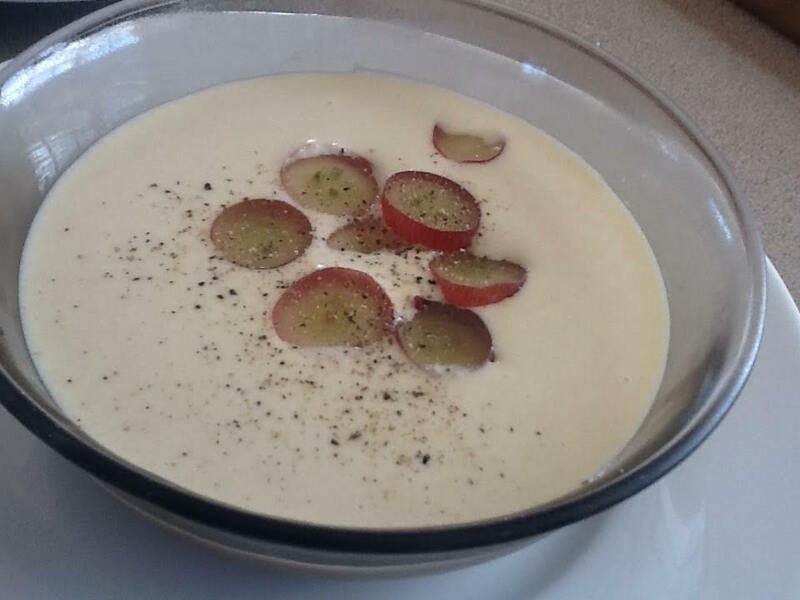 Or try this unusual Chilled Almond Soup which also comes from Spain and involves no cooking. Buy a couple of salmon fillets (boned and skinned) and make Gravlax which “cooks” in the fridge and is absolutely delicious served with sweet mustard sauce, dark brown bread or blinis. I buy my salmon at Costco because you can be 100% sure no bones have been left. 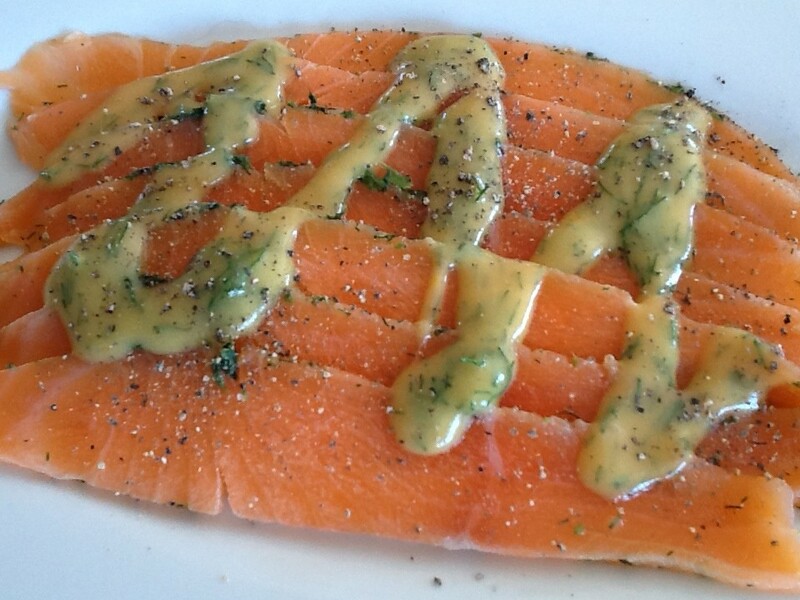 Once made you can cut each salmon fillet into 2 or 3 pieces and freeze what you’re not using immediately. 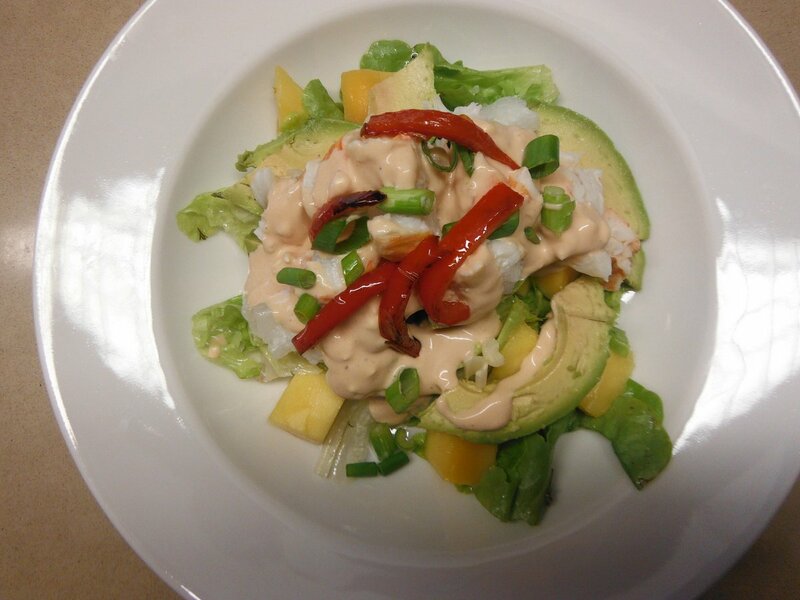 Splurge on some lobster tails and make this divine Lobster, Mango and Avocado salad to enjoy with a glass of Riesling as the sun goes down. I grew up in England where it never gets as hot as it does in Australia. 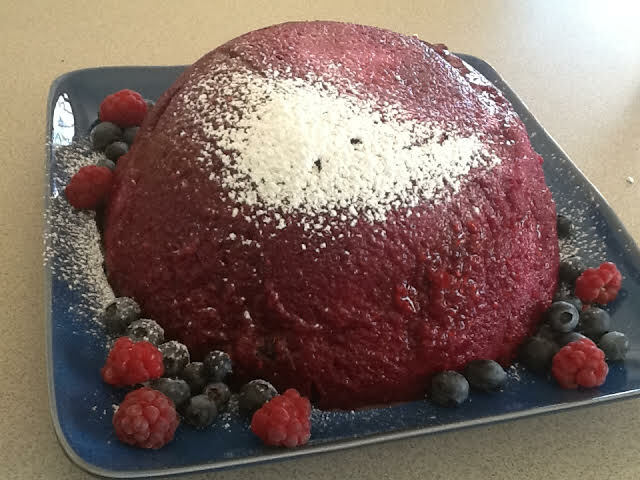 Summer Pudding is the dessert they make in the height of the UK summer, when the berries are all in season. One of my all time favourites. 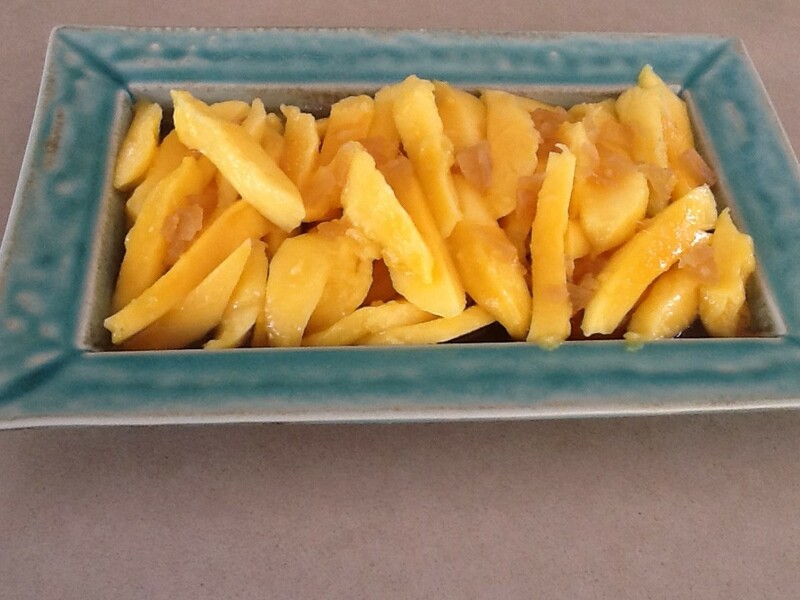 And while they’re in season and cheap why not make Mangoes in Ginger Wine. The perfect way to finish dinner on a hot summer’s evening. 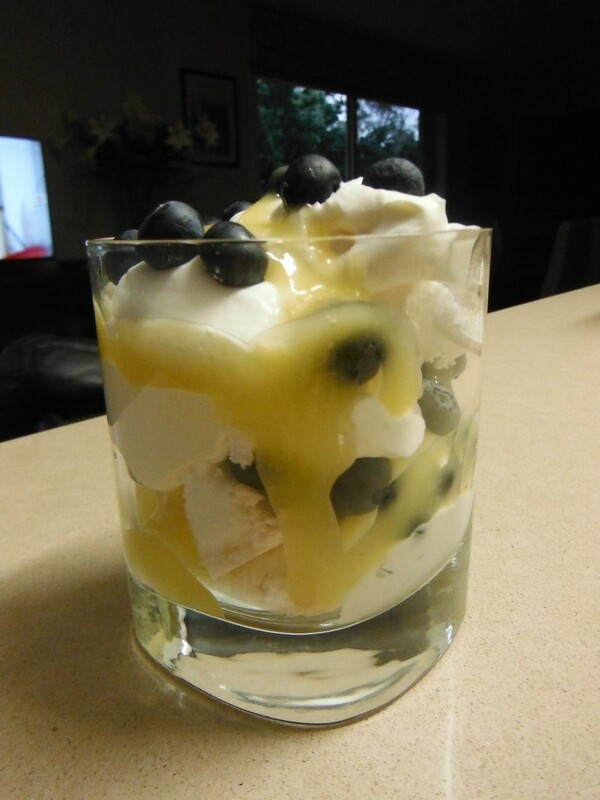 If you’re still looking for inspiration for dessert have a look at this article Seven Quick Desserts where you’ll find several ideas, including Blueberry Parfaits which can be put together quickly from ingredients bought at the supermarket. 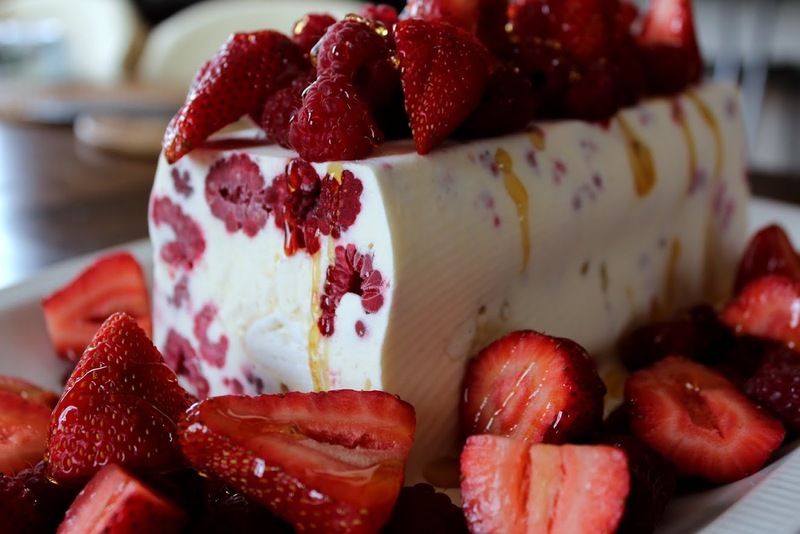 Instead of blueberries, try using raspberries or strawberries. Time to go back to my book and crank the aircon up another notch. My father left the Royal Air Force after the War, to help his father run the family nursery, which he eventually took over. To earn pocket money I worked on Saturday mornings in the shop where we sold all the produce. Grandpa sat in the corner and appeared to be dozing. In fact he was watching me like a hawk. The tomatoes were weighed to order and the adding up was done in your head – quite a challenge for an 11 year old. “You put one too many in that last pound of tomatoes. If you do that every time, you’ll put us out of business,” Grandpa would say. Dad’s mother Jessie, who was from Falkirk, just outside Edinburgh, was an excellent cook. Grandpa met her when he was in charge of the gardens at Battle Abbey in Sussex and she was running the dairy. I often wonder how a young Scottish lass ended up working nearly 500 miles away from home, but by the time I wanted to ask she had been dead for many years. My mother grew up in Malta where her father was stationed during the War with the Royal Engineers. Strict rationing meant she was never allowed to cook, in case she ruined precious ingredients. Before they married Dad asked his future bride if she could cook. She said no and he thought she was being modest. She couldn’t boil an egg. From working in the dairy of Battle Abbey my maternal grandmother had learned many skills, including how to make butter into swans for afternoon tea. In the early years of marriage, my mother grew sick of hearing my father waxing lyrical about the swans. “If you want swans made of butter you’d better go back,” she would say, teasingly. 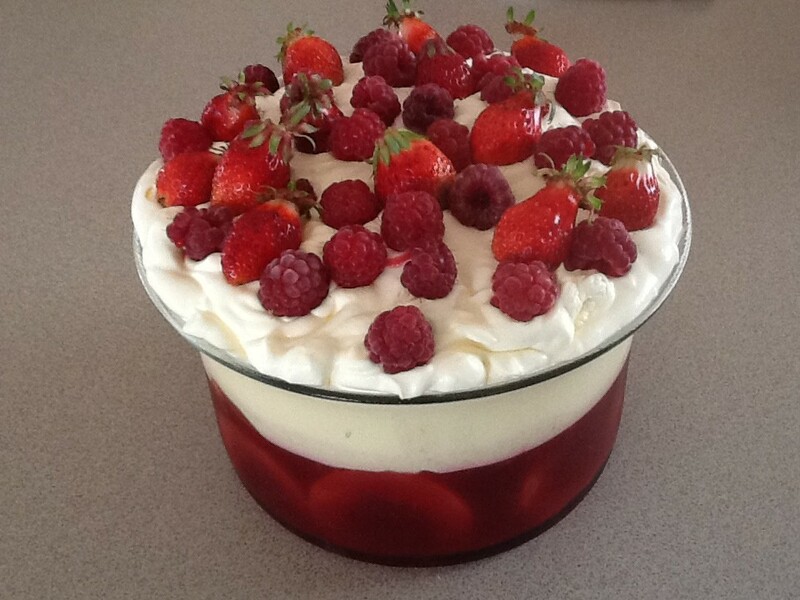 Fortunately, Nana took Mum under her wing and taught her to make a few basic recipes, so we wouldn’t starve. Not the swans, but more practical things. Once a year Dad would bring in a couple of boxes of ripe tomatoes from the nursery and the whole family helped turn them into tomato chutney, using an old family recipe. Matthew and I met in Geneva when he was working for the Australian Mission to the UN and I was working for the British FCO. He had recently broken up with a long time girlfriend and I was also footloose and fancy free when a mutual friend invited us to a tramps and tarts party. The rest, as they say, is history. Matthew and I met in October and married the following May. He always says he married me for my tomato chutney, amongst other things. Needless to say, running out of tomato chutney is grounds for divorce in our house. Over the years I’ve only made two slight adjustments to this very old recipe. I use cider vinegar instead of dark malt vinegar and have cut down a bit on the sugar and salt. It’s crucial to use vine-ripened, very red, tasty tomatoes. The hard, orange, tasteless ones you buy in supermarkets in winter will produce a very mediocre chutney. 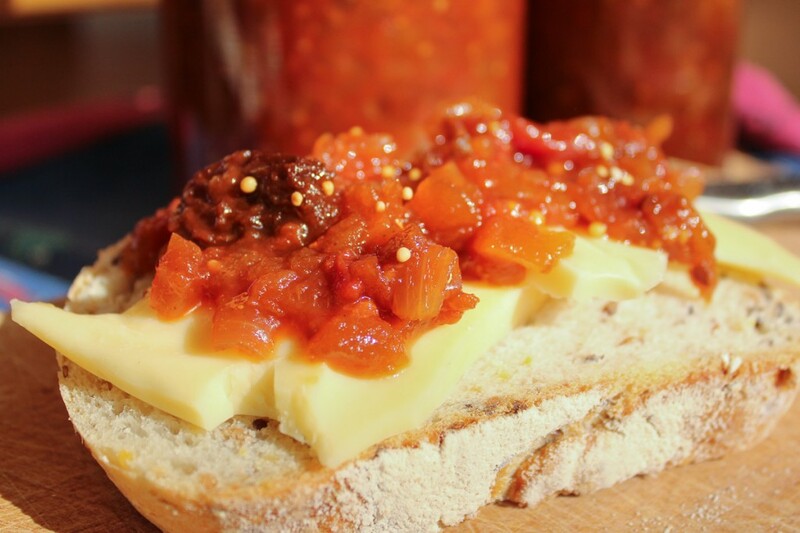 Tomato chutney goes well with cheese, ham and other cold meats. You will need a large preserving pan with a heavy base for this recipe. Mine is stainless steel and has a diameter of 33cm and a height of 15cm. It holds about 7 litres. Alternatively make half the recipe in a large heavy-based saucepan. Pour boiling water over tomatoes and leave for a couple of minutes, then remove skins and chop. Core and chop the apples and chop the onions. Place pickling spices in a muslin bag or tie them in an old cotton handkerchief. Place all ingredients except mustard seeds in preserving pan. Cook for about an hour at a steady boil, until thick. Stir regularly to prevent sticking, especially towards the end. Meanwhile place sufficient clean jars (without their lids) in the oven set to 120°C. Or you can zap them in the microwave on High for 2 minutes. How many jars you use will depend on the size of the jars. When chutney is cooked remove pickling spices, squeezing the bag so any juices go back into the chutney, then discard the spices. Stir in mustard seeds and pour into the hot sterilized jars using a small jug. Poke a knife down right to the bottom of each jar, all the way around the edge, to remove any air bubbles. Seal jars with the lids and store in a dark cupboard. Keeps for at least 12 months. Note: Apples which go mushy when cooked, such as English Bramleys, are best, but they are hard to find in Australia. We’ve planted a tree and should get our first crop in a year or two. Alternatively use Granny Smiths, although the apples will stay in pieces when cooked. 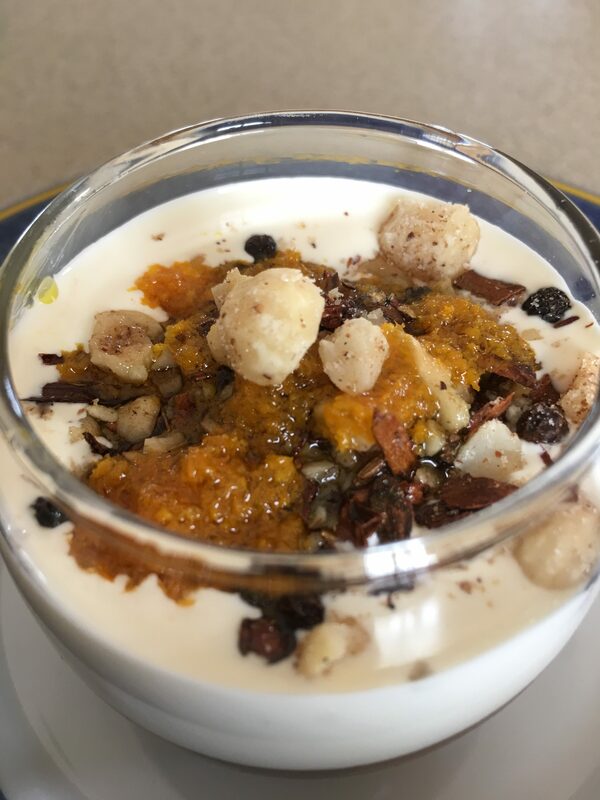 Sultanas can be used instead of raisins, but they are not quite as nice. Mix and keep in a jar. If the cinnamon sticks are very hard you may need to hit them with a meat mallet to break them up. I usually make 4 times the recipe at a time for which quantities are in brackets. Pimento (also known as Allspice) look like very large black peppercorns. Use pillow cases to store various food types in a chest freezer e.g. red for beef, blue for lamb. Stops things getting lost down the bottom and makes it easier to find what you need. Use old ones or buy some cheap brightly coloured ones. Freeze whole fresh chillies in a ziplock bag so you always have them on hand. Chopped lemon grass also freezes well. Peel half a kilo or so of fresh ginger then chop finely in food processor. Freeze in ice cube trays, tip into a ziplock bag or container and freeze. 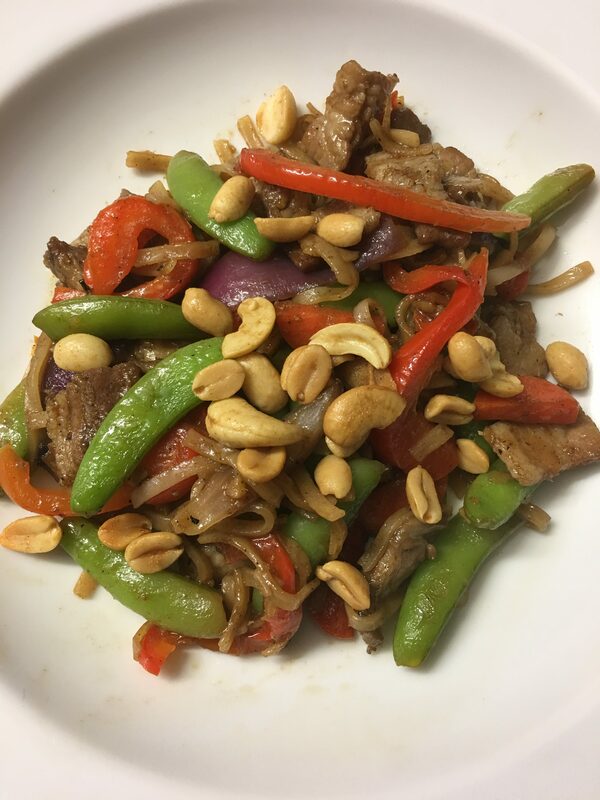 Perfect for stir-fries and marinades. Make a batch of Pesto during summer when fresh basil is available. Freeze in ice cube trays, then store in a ziplock bag to use over the winter months. Passionfruit pulp also freezes well in ice cube trays. So does tomato paste. Avoids throwing out half a jar because it’s grown fur in the fridge! Save hotel shower caps and use to cover large bowls and platters in the fridge. Easier than plastic wrap which doesn’t always stick to things. Toss in the washing machine then dry on the line and use again. Don’t throw away leftover or stale cornflakes, savoury crackers, corn chips, rice crackers, potato chips or other savoury snacks. Blitz them all together in the food processor and keep the crumbs in a jar. Use to make Healthy Oven-Baked KFC. Wash salad greens, spin dry, then store in the salad spinner in the fridge where they will stay crisp and fresh for several days. My favourite salad spinner is made by Zyliss and I have two of them. Freeze whole bananas in their skin to use (peeled) for banana cake or smoothies. Freeze whole green grapes and use to chill a glass of white wine when the weather is very hot, without making it watery. People often ask how I calculate food quantities for large crowds. 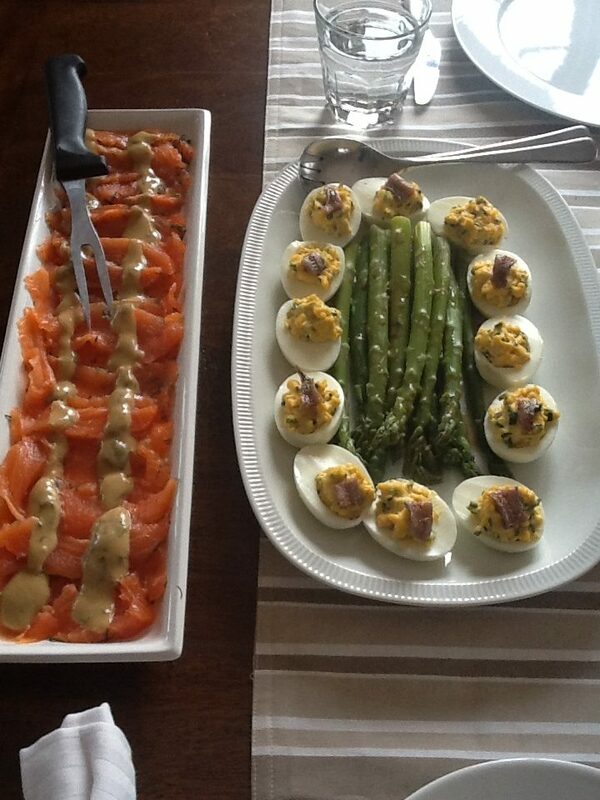 For a two hour drinks and nibbles party I allow 10 pieces of finger food per person. Some will eat less but others will make up for it! If guests are likely to stay longer than two hours or you have a lot of young guests – especially men with hollow legs – allow extra! On a recent trip to Europe we caught up with quite a few friends and family in Denmark, England and France. It was so nice to return to Copenhagen (12 years after we lived there) and find that our old friends still wanted to hang out with us. As we walked in the door the cork would pop off the first bottle of champagne, then we’d have a lovely time eating, drinking and being merry. Just like we’d never been apart. When we left a couple of days later they went back to their normal, more sensible, regime, while we moved on and started all over again. This is why we like to spend a few days on the way back to Australia at a resort in Thailand, to recover. A week of swimming, reading, massage and early nights, with no wine and just the occasional beer or cocktail means we get home looking and feeling like we’ve had a holiday. For the past few years we’ve stayed in Khao Lak, a 75 minute drive north of Phuket airport. It’s relatively quiet, the way Phuket was 20 or 30 years ago. I send an email to a taxi company called “Cheaper than Hotel” and when we walk out of the airport there’s our driver waiting. Breakfast at the Chong Fah resort where we’ve stayed two years running is substantial, so we skip lunch and go out for dinner after a Happy Hour cocktail at sunset. The nearby resort named Casa de la Flora (which in correct Spanish should be Casa de la Flor) serves delicious modern Thai food. 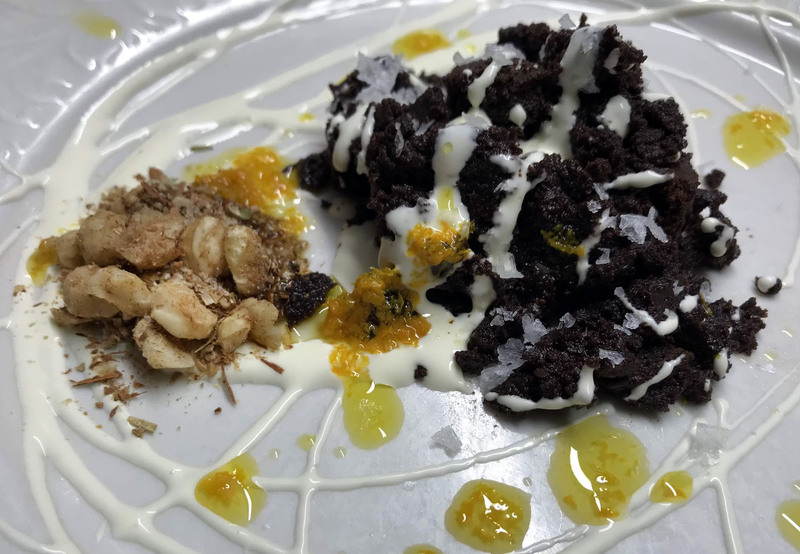 We dined there twice and both times ordered this dish which I have done my best to replicate. 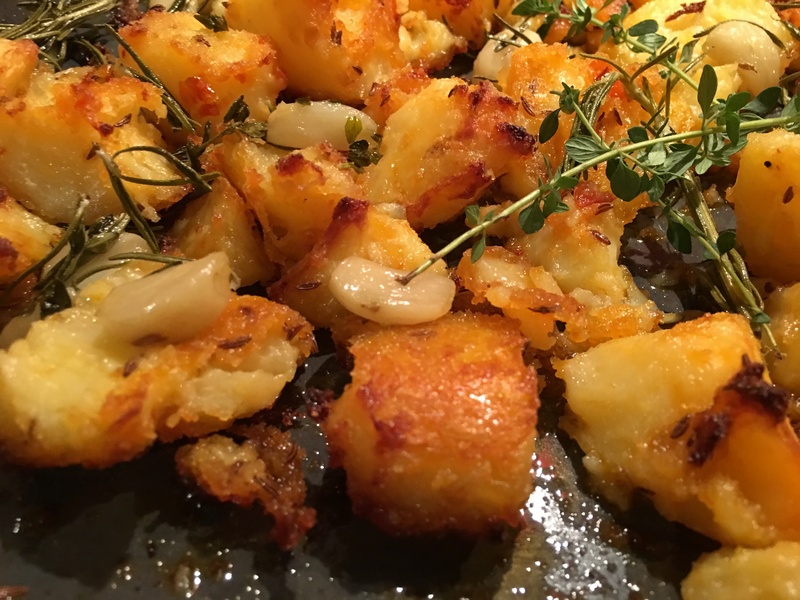 The recipe serves 4 as a light main course or 8 as a sharing plate. Pour boiling water over the dried shrimp. Leave for 15 mins then drain. Cut the papaya and carrots into julienne strips. Mix all ingredients for salad. Mix dressing and add to the salad. Season salmon then place in a non-stick frying pan, skin side down. Turn on the heat to moderately hot and cook for 3-4 minutes, until skin is crispy, then turn over and cook for another 3-4 minutes, or until done to your liking. Divide salad between 4 serving plates. 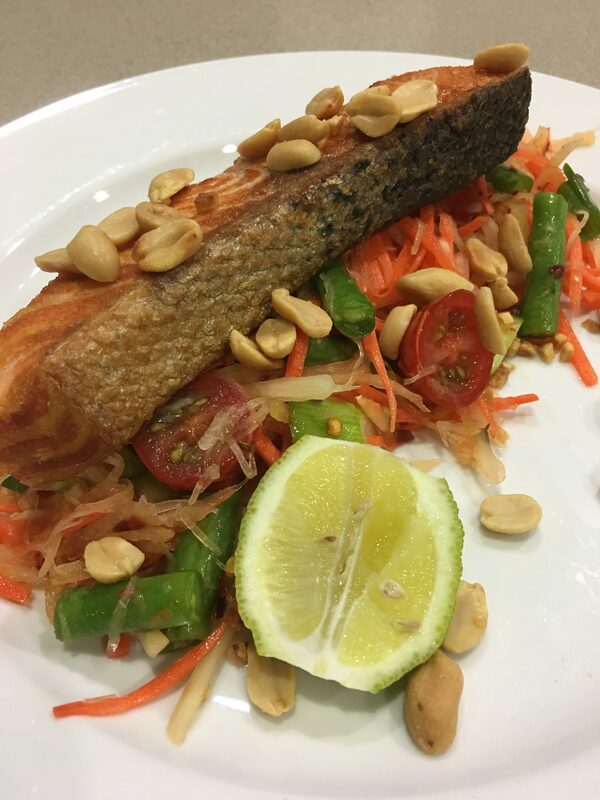 Top with the salmon and garnish with the lime, cut into cheeks or wedges and the peanuts. 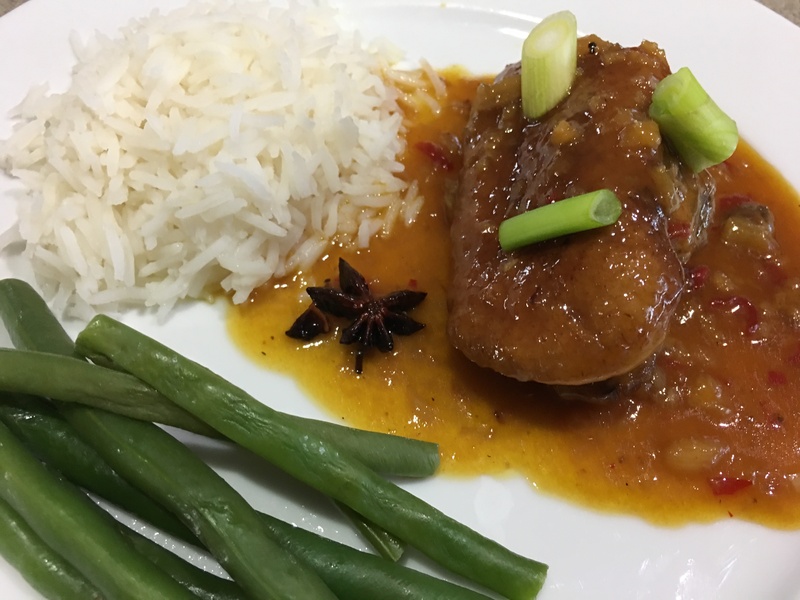 If you like sticky Asian chicken dishes you’ll like this one. I used less than half the amount of sugar in the original recipe (which I thought was a bit over the top) and it worked well. Cut chicken into 2.5cm (1 inch) chunks. Mix with the fish sauce, brown sugar and lemon juice and marinate for an hour or two. Place all ingredients for the glaze in a small saucepan. Bring to the boil then simmer for a few minutes to thicken. 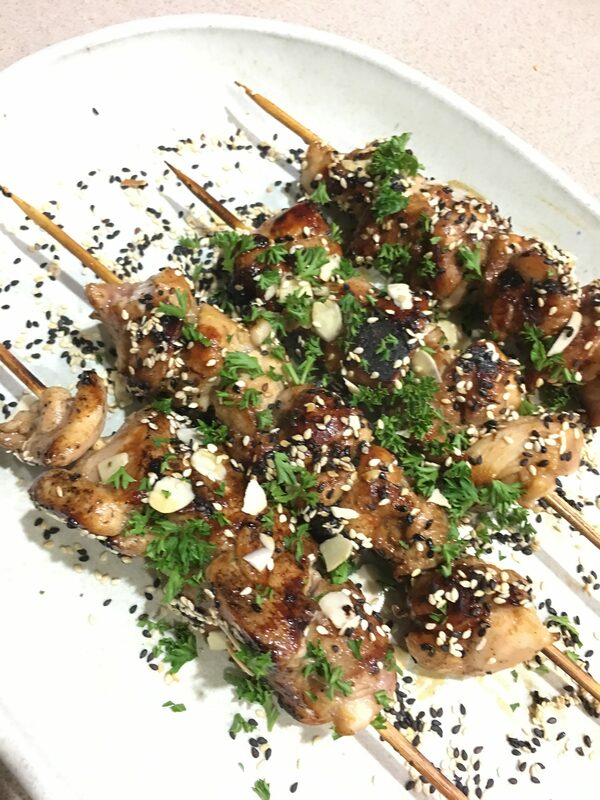 Thread chicken onto 8 bamboo skewers which have been soaked in cold water. Cook on a grill or BBQ for about 8 minutes, brushing regularly with the glaze, or until cooked through. Cook for about 2 minutes on each of the four sides. Place sesame seeds and almonds in a dry frying pan and stir over moderate heat for a few minutes or until golden. When kebabs are cooked place on serving dish and brush again with the glaze. Sprinkle with the sesame seed mixture and the spring onions or herbs. Serve with steamed rice and a cucumber and onion salad.